Rarely does a vehicle deliver fully what it promises and at a reasonable price. 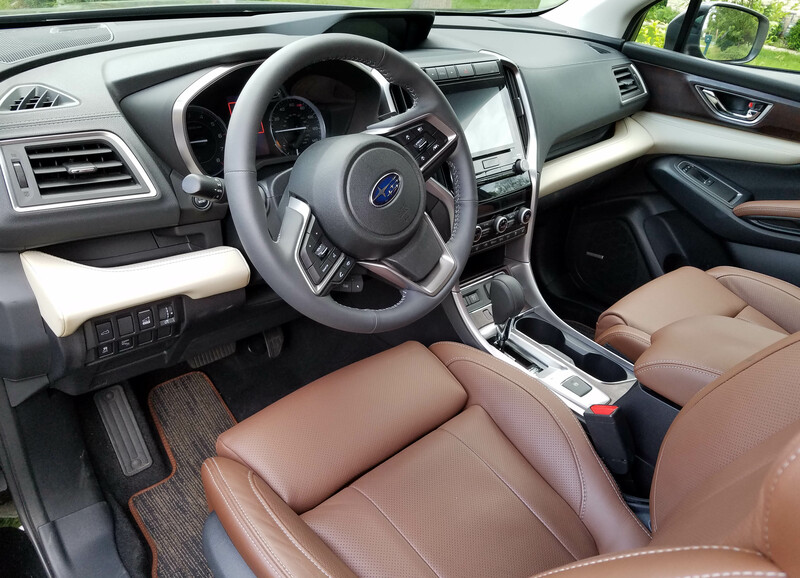 Ascent offers room for seven or eight passengers, a comfortable and useful interior, good power and handling, plus Subaru’s noted all-wheel-drive. Pricing starts at $32,970. Yes, you read that right. Lest you think that’s for a stripped down model, well, think again. 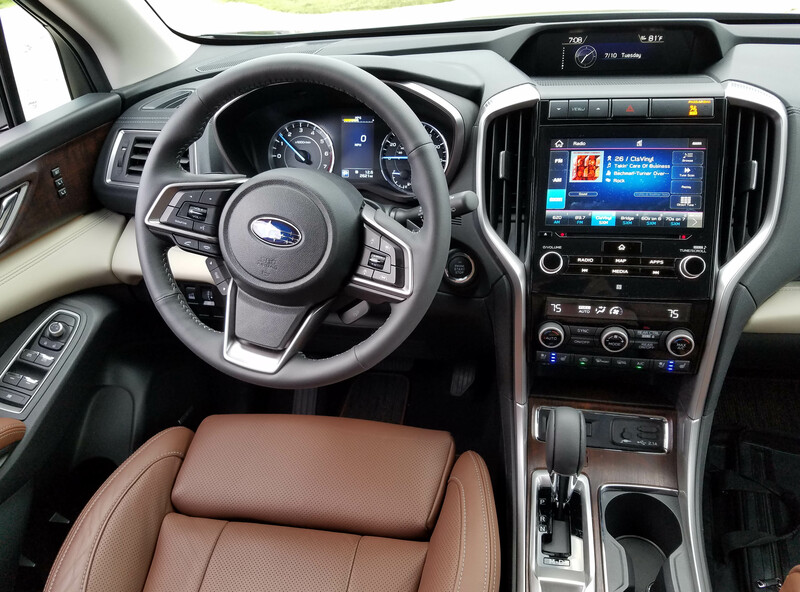 Standard on the Ascent is AWD, Subaru’s EyeSight safety system, X-Mode with Hill Descent Control (in case you go off road), rearview camera, adaptive cruise control with lane keep assist, roof rails, remote key fob, three zone climate controls, and 19 (count ‘em) cup and bottle holders. I easily loaded seven of the extended family, including adults and grandchildren, aboard for a trip to Green Bay’s Bay Beach Amusement Park. We all fit comfortably, along with picnic coolers and such under the crossover’s power rear hatch. We could even have stored more under the cargo area’s floor. Riders praised the seat and leg comfort in all three rows, but more on the interior in a bit. Power may be the biggest surprise from the Subaru as power is rarely a major Subie feature. Its boxer engines have decent power and efficiency, but oomph they generally lack. However, the Ascent uses a new turbocharged 2.4-liter boxer that creates 260 horsepower and 277 lb.-ft. or torque. Even fully loaded we had plenty of passing power on the freeway. Gas mileage was reasonable too, about 21.8 mpg for the road trip along with some city driving. Subaru uses a Lineartronic CVT so shifting is smooth and efficient here. Plus you can manually shift it if you want to boost performance a bit. Handling is fairly precise with quick steering that lends a sporty flair to this mid-size crossover. Steering wheel feel is heavy, but with its smooth and sporty reacting to driver input that heaviness never was an issue. Ride is well-controlled and comfortable too. Road imperfections were of minor import to the passengers. There’s no jolting or jarring, making this a fine family hauler for road trips. Braking is good too with discs all around, plus the AWD system to give it steady traction in wet weather or during mild off-roading. Ground clearance is 8.7 inches, so this will traverse camping sites with a fair amount of mud and muck, and the Hill Descent feature will help the Subie slowly and safely slither down a steep hill. 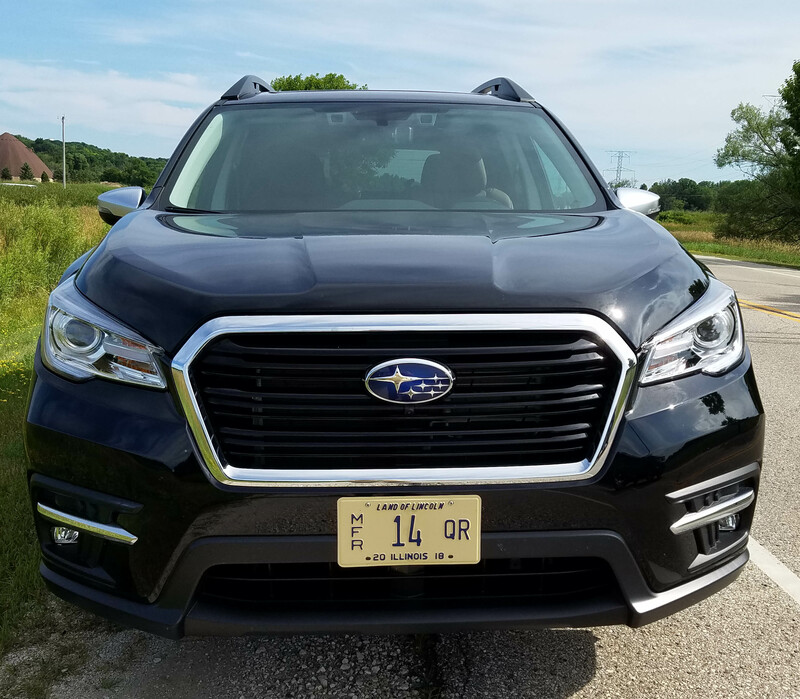 As a driver all of the above were vital to me, but the family was most impressed with the interior, especially after we drove a couple higher priced SUVs the weeks after the Subaru. There was more room and a higher overall comfort level here than in those luxury makes. 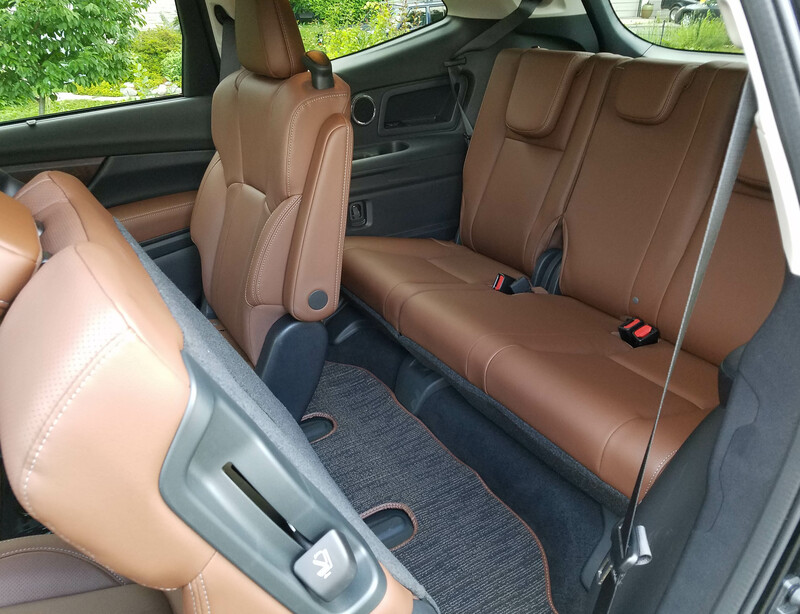 My sparkling black (Crystal Black Silica) test vehicle featured a dark brown and black interior with the perforated leather seats being dark brown and the dash black with tan trim in the center and fake wood on the doors. Matte silver trimmed the center stack and air vents, plus the steering wheel hub. The wheel was wrapped in a thick leather. Everyone who rode in the Ascent praised its seats. They were well contoured front and rear with particularly good back support. The driver got a power lumbar support, and two memory setting buttons on the door. The steering wheel was heated, as were the powered front seats, which also were cooled. The second row captain’s chairs, complete with armrests, also were heated. Talk about a vehicle designed for Wisconsin winters! Adults sitting in that third row also were happy with the leg room and seat comfort, a rarity in three-row vehicles, unless they are giant trucks like a Chevrolet Suburban. Folks were happily surprised by all the cup and drink holders, plus electrical hookups. There are USB ports for each row so everyone can stay connected and charged. Second row windows also included manual sun screens, a plus on sunny summer days, and a feature that keeps small ones from being baked and made uncomfortable (and crabby) on a long drive. Up front again there is a big 8-inch info touchscreen in this top-level Touring model I tested. The standard screen is 6.5-inches. This big one was both easy to see and use, another benefit not all vehicles offer, no matter their price. Other benefits include an inside hatch release and you can program the hatch to open to various heights, something useful when popping it inside a garage. There are info screen buttons to the left and behind the tilt/telescope steering wheel’s hub and the usual assortment of radio, phone and cruise controls on the hub. The captain’s chairs in the second row fold and slide forward for easy access to the third row seat, which proved roomy enough for adults. 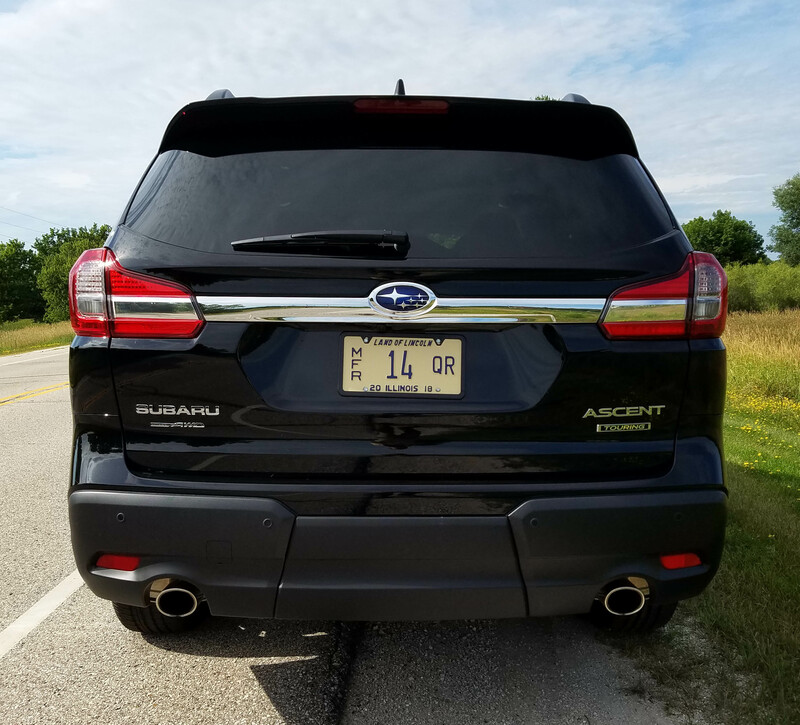 As mentioned earlier Subaru’s Ascent is loaded with standard safety features, including a rearview camera and EyeSight, which is Subaru’s safety system that notes if you’re gaining too fast on another car, senses if a vehicle pulls out in front of you and generally is a second set of eyes for the driver. It works well, maybe too well sometimes. I detest lane departure warning systems, a part of EyeSight. So clicked it off repeatedly. Oddly the button to control this is overhead. And while disengaging lane departure stops the incessant beeping that occurs if you change lanes without activating a turn signal, or simply approach a lane marker, it didn’t stop the beeping entirely. On my highway drive I noted that it still warned me, with a beep, when there was a car in my blind-spot (passing me on the freeway), or if I was advancing quickly on a car in my lane, which happens a lot on the freeway as folks dawdle to text and read emails while driving. I fully recognize the safety aspect of all this equipment, but the beeping is annoying and can be distracting. An aside here for families with little ones. All that beeping does NOT help young ones doze or nap in the car. A small flashing light on the dash or in the rearview mirror might be better in that regard. 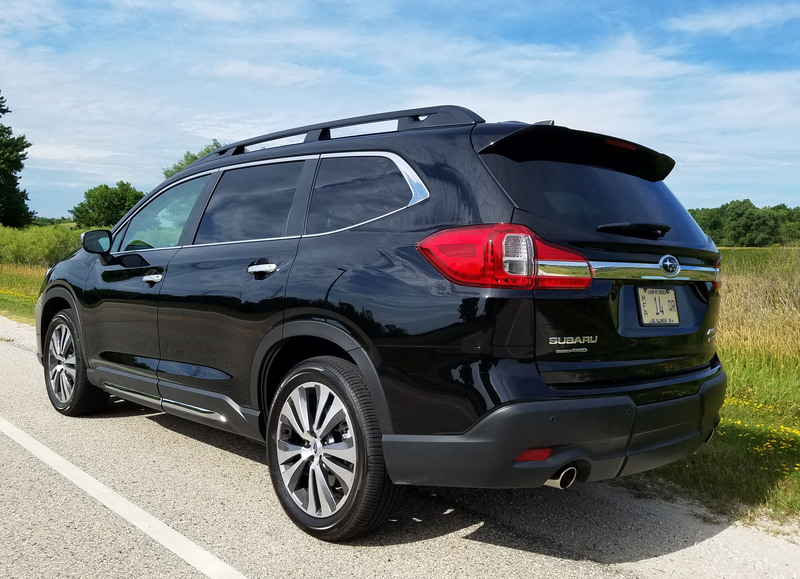 Other safety devices on the Ascent Touring include blind-spot detection, rear cross traffic alert, heated exterior mirrors, footwell lighting, and steering responsive headlights. A few additional interior pluses include a large armrest/storage box between the seats and big glove box too. Overhead is a HomeLink system in the mirror and the Touring model has a Harman Kardon premium sound system with 14 speakers. A rear seat DVD entertainment system would be a great addition here too. Practically speaking, there’s17.6 cubic feet of cargo room behind the third row seats. Fold those and the second row seats down flat and there’s 86.0 cubic feet of space, a huge amount. For those towing small trailers or boats when on a family outing or vacation, the strong Subaru will tow up to 5,000 lbs., the most ever from the brand. Gas mileage, as mentioned earlier, is decent. The EPA rates this at 20 mpg city and 26 mpg highway. I got nearly 22 fully loaded and about 75% highway miles. In a more city-centric drive I got just 21.1 mpg. This turbo happily drinks regular unleaded too. 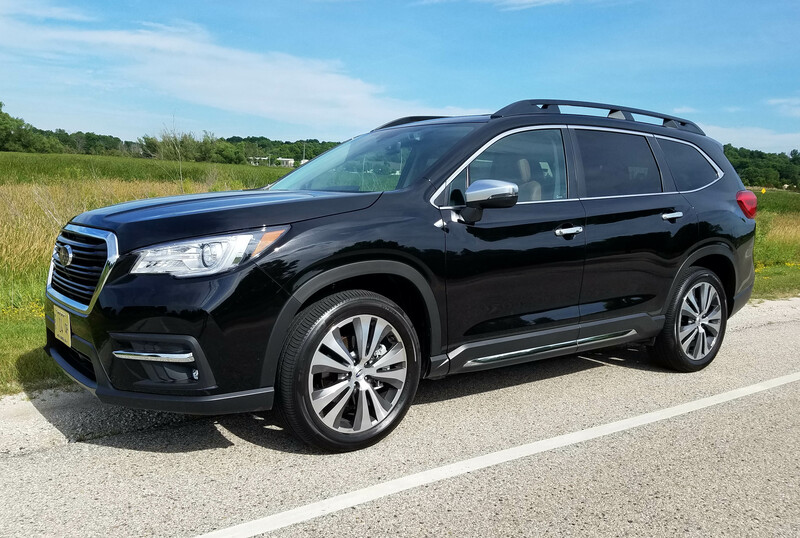 The base Ascent lists at $32,970, including delivery, but there are three more trim levels you can ascend to. Premium lists at $35,170 and Limited (likely the best seller) at $39,970. Limited adds LED headlights, fog lights and lower door cladding with chrome accents. 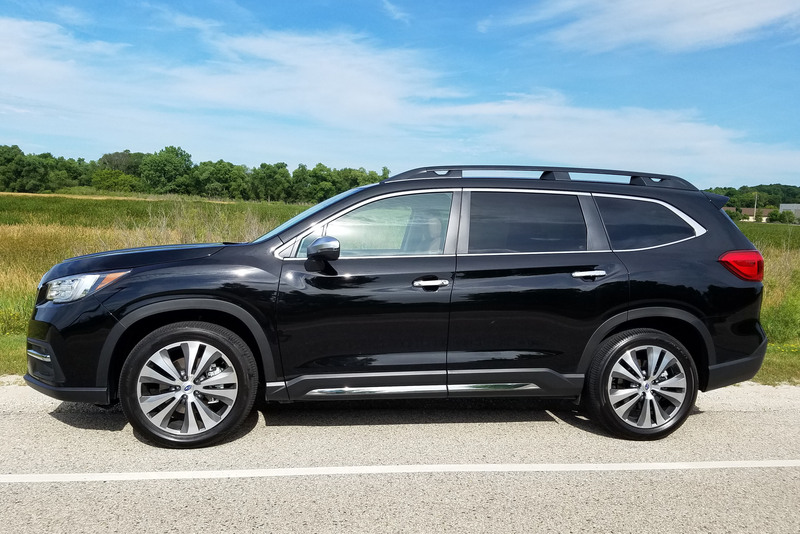 Once you reach the tested Touring model the price increases to $45,670, but this one needed no options at that and added 20-inch tires (vs. 18-inchers on other models), the bigger touchscreen, chrome exterior trim, and satin silver side mirrors. One final note, the Ascent can be equipped with a bench-style middle seat to seat three, which then makes it capable of carrying eight passengers. That puts it in rare automotive company these days. But Ascent is rare mostly for doing all things well and still starting at a family-friendly price. Hits: Power, ride, handling and comfortable room for seven. 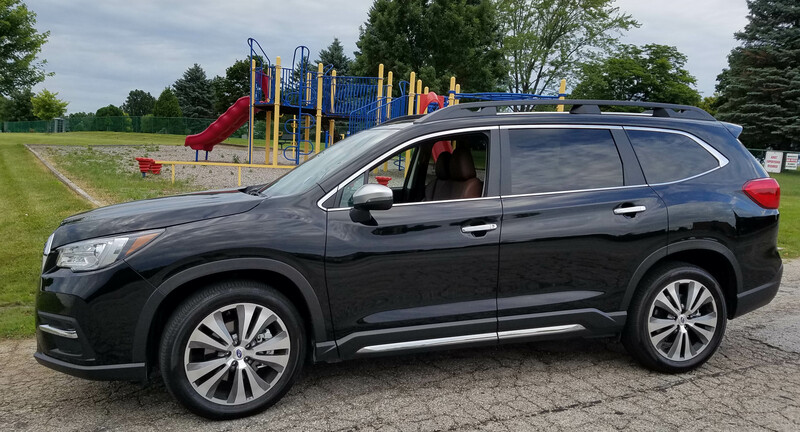 Full load of safety devices, heated steering wheel and seats, cooled front seats, comfy interior, second-row captain’s chairs, panoramic sunroof, and power hatch. Plus AWD! Misses: EyeSight safety system beeps too much, even when switched off.